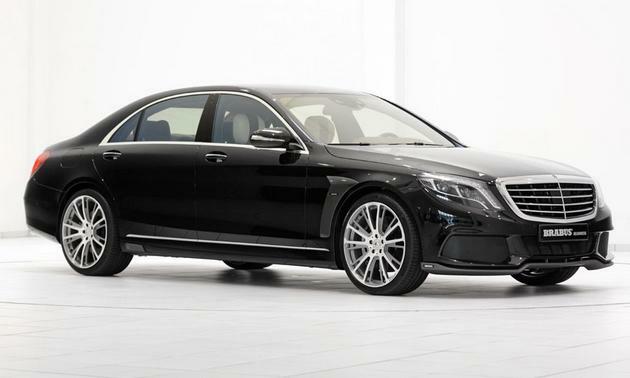 I find it poetic that I should be writing about the behemouth known as the Mercedes-Benz S-Class-based Brabus 850 6.0 Biturbo “iBusiness” today. And, I’ll tell you why. As I was driving down I-95 today up near Palm Beach, I passed what may be the most ridiculous car a tuning company as every put forth, a 120 horse Brabus Ultimate 120 Smart Car. While 120 horse out of a Smart ForTwo is impressive, I am much more interested in the 850 horse Biturbo “iBusiness”. The insane folks at Brabus claim the 850 6.0 Biturbo “iBusiness” is the “fastest and most powerful luxury sedan in the world” (note: that last part should be read in Jeremy Clarkson’s voice). And with 850 horses and a holy-crap-that-can’t-be-right-let-me-check-that-number 1,069 pound-feet of toque from the 5.9 liter twin-turbo V8, I’m not inclined to argue against that claim. In the name of longevity (read: prevention of car going “boom!”) Brabus has electronically limited the torque of the 850 6.0 Biturbo “iBusiness” to a paltry 848 pound-feet. But, fear not. The jaunt from 0-62 mph in this tuxedoed monster that is more Mr. Hyde than Dr. Jeckyl is a quick 3.5 seconds (0-60 mph in ~3.3 seconds). Top speed will have to do at 217 mph. Pfft. Whatever, I’ve been faster than that… in a jet. Now, you read numbers like 217, 850 and 3.5 and you think supercar. Supercar ride, supercar comfort, supercar convenience. Nope. This is still a Mercedes-Benz S-Class at its core. That means comfy seats, stratospheric leg room, a five-body trunk and a fit-and-finish that would make Emperor Napoleon jealous (and he had a vest with diamond buttons. Oh, and serious amounts of cool gadgets. That’s where the “iBusiness” in Brabus 850 6.0 Biturbo “iBusiness” comes in. The back seat is like some sort of crazy mobile missile command center. There is an iPad Mini snugly set into a center console between the rear seats which controls the Mercedes COMAND sytem. I wonder what happens when the new iPad comes out. Your ridiculously expensive mega-car will be obsolete. That has to hurt. Anyway… that iPad is also connected to a Mac Mini in the trunk through the car’s wireless hotspot. There is also a 64 gig iPod Touch hooked up to the audio system, which makes no sense. Why not just use the Merc soundsystem and link a solid-state hard drive to it? You’ll get at least 250 gigs of space. A 15.2 inch monitor graces the rear seats as well. Cool. As with all Brabus, the 850 6.0 Biturbo “iBusiness” can come done up with almost any paint, leather and Alcantara you can think of. No idea how much this monster costs, but I imagine a lot… like small nation’s GDP a lot. By the way, if a trunk isn’t your thing, you can get the Brabus 850 6.0 Biturbo as a Shooting Brake as well. For the rest of the info, check out the enormously long press release below. – The exclusively appointed luxury sedan based on the new Mercedes S-Class is powered by a V8 Biturbo high-capacity engine that produces 625 kW / 850 hp (838 bhp) and reaches a top speed of 350 km/h (217 mph). – The “iBusiness” infotainment system is based on state-of-the-art components from Apple such as iPad, Mac mini, iPod touch and Apple TV, which are controlled and coordinated via the newly developed BRABUS Remote app. In addition, the “iBusiness” system was designed to allow control of all functions of the COMAND system of the S-Class from the rear seats using an iPad mini. – The exclusive appointments of the BRABUS 850 “iBusiness” also include a sporty-elegant designer outfit for the body, forged BRABUS “PLATINUM EDITION” 21-inch wheels, a high-performance braking system with carbon-ceramic discs and an exquisite, two-tone all-leather interior. With the presentation of the “iBusiness” at the IAA in Frankfurt the new BRABUS 850 6.0 Biturbo high-capacity engine also celebrates its world debut. In best BRABUS tradition it follows the old but still true wisdom that nothing can substitute for displacement other than more displacement. 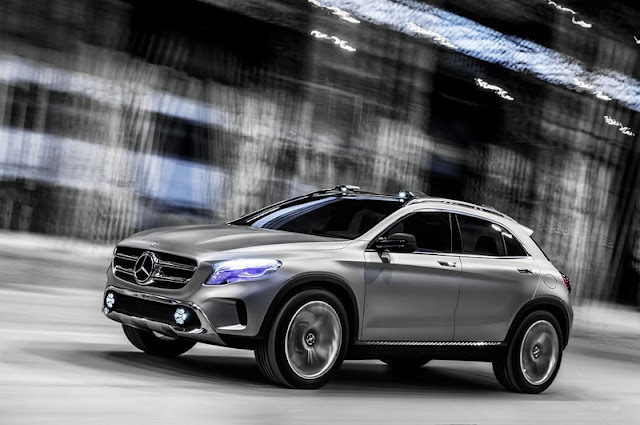 The new engine is based on the latest Mercedes 63 AMG eight-cylinder four-valve engine. For the increase in displacement to 5,912 cc (361 cu. in.) the BRABUS motor engineers brought their entire know-how amassed in the more than 35 years of the company’s history to bear. Numerous engine components had to be newly developed and the engine block, cylinders and cylinder heads had to be extensively re-machined in the company engine-building shop. Increasing the eight cylinder bores to 99 millimeters (3.89 in.) allows the use of special forged pistons with modified surface contours to achieve an even more efficient combustion. They are connected by billet piston rods to the precision-balanced billet crankshaft with a stroke of 96 mm (3.77 in.). The two special BRABUS turbochargers with larger compressor unit and modified exhaust manifolds are of course also a major factor in the enormous increase in power by 195 kW / 265 hp (261 bhp) over the stock engine. Other performance-enhancing upgrades on the exhaust side are the metal catalysts with 75-millimeter-thick (2.95 in.) downpipes and the BRABUS stainless-steel sport exhaust whose pipe connectors have a diameter of 76 millimeters (3 in.). The BRABUS installations on the intake side are immediately apparent upon opening the hood: in addition to the fiery-red BRABUS design accents on the engine, the BRABUS Gold Heat Reflection sheathing for the intake and charge-air tubes right away catches the eye. This measure also contributes to the high-performance experience provided by this engine, as does the newly designed BRABUS 850 intake manifold for the eight-cylinder four-valve engine. It includes a larger air filter box with enlarged intake cross section, which gets its air supply via a special air duct in the hood. Also part of the package is the carbon-fiber intake pipe with larger diameter, which was positioned behind the new BRABUS fascia directly exposed to the relative wind. Special mapping for the engine management system programmed on the BRABUS high-tech engine test rigs and during road tests coordinate all high-performance components perfectly. This benefits not only the gigantic power yield, but also the outstanding throttle response and refinement of the engine across the entire rev range. The performance data of the BRABUS 850 6.0 Biturbo high-capacity engine are correspondingly impressive: the V8 produces its peak power of 625 kW / 850 hp (838 bhp) at a low 5,400 rpm U/min. The equally potent peak torque of 1,450 Nm (1,069 lb-ft) is limited in the car to 1,150 Nm (848 lb-ft) to protect the powertrain as a whole. It is available steadily on a plateau between 2,500 and 4,500 rpm. 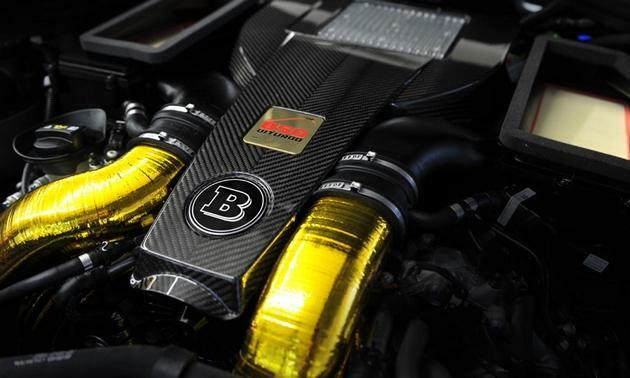 BRABUS exclusively uses high-performance lubricants from technology partner MOTUL. A BRABUS limited-slip differential with a locking rate of 40 percent is available as an option. In conjunction with the modified AMG SPEEDSHIFT MCT 7-speed sports transmission the BRABUS 850 “iBusiness” delivers a performance only attained by a very few full-blooded and significantly lighter sports cars. Sprinting from 0 – 100 km/h (62 mph) in 3.5 seconds is just as unrivalled in this class of vehicles as is the electronically limited top speed of 350 km/h (217 mph). The transmission either sorts the gears automatically or allows drivers to shift manually using the BRABUS aluminum shift paddles on the steering wheel. This unique driving sensation is accompanied by an exhaust note that can be either subtle or thrilling. The BRABUS sport exhaust system with controlled butterfly valve offers drivers the option to actively control the exhaust note at the push of a button on the steering wheel. It determines whether the luxury sedan operates in a subtle and quiet “Coming Home” mode or announces its V8 power full-throated to the world in the “Sport” position to the enjoyment of the driver. It goes without saying that BRABUS performance kits are available for all Mercedes S-Class engines. The plug-and-play BRABUS B50 – 520 PowerXtra CGI performance kit for the 4.7-liter eight-cylinder Biturbo engine of the S 500 uses special mapping for injection and ignition as well as a moderate increase in boost pressure to bump the power output by 65 horsepower. 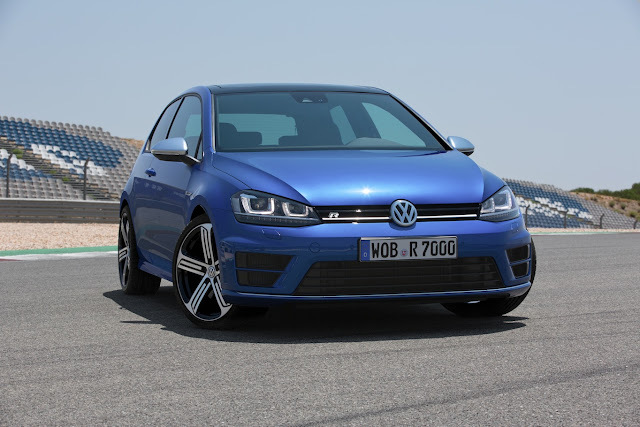 After the conversion the engine’s power output jumps from 335 kW / 455 hp (449 bhp) to 382 kW / 520 hp (512 bhp) and peak torque grows to 820 Nm (605 lb-ft). This propels the four-door car from rest to 100 km/h (62 mph) in just 4.2 seconds. The BRABUS Vmax unit that is part of the engine tuning allows limiting the top speed electronically to 250, 275 or 300 km/h (155, 171 or 186 mph). BRABUS is one of the pioneers in developing innovative, functional multimedia systems that are stylishly integrated into the automobile. The 1.0 generation of the BRABUS “iBusiness” concept building on the Apple iPad was presented in the Mercedes S-Class of the W/V 221 model series in 2010. Now, several evolutionary stages and one vehicle generation later, the new BRABUS 850 “iBusiness” celebrates its world debut. In the refined ambiance of a BRABUS fine leather interior crafted to perfection down to the last detail the passengers have the latest generation of Apple computer technology for global communications and entertainment at their disposal. The BRABUS “iBusiness” multimedia system incorporates an iPad mini tablet into the rear compartment. To this end the BRABUS designer developed a custom center console, which is installed between the two individual seats in the rear, and is equipped with a docking station. The docking station not only secures the table computer safely in place when not in use, it also recharges the computer’s battery. The iPad mini is not only for communication with the outside world. The integration of the “iBusiness” concept into the vehicle’s on-board electronics also allows all functions of the S-Class COMAND system to be controlled from the iPad mini. In addition, the mobile computer is connected to a Mac mini computer via the InCar-Hotspot. The Mac mini serves as the mainframe. The ultra-compact yet particularly powerful computer is housed safely in an electrically operated custom-designed drawer in the trunk of the S-Class. The BRABUS programmers developed the innovative BRABUS Remote app to facilitate communication between the individual modules of the multimedia equipment. Of course there is also a special BRABUS app for iPad, iPhone and iPod. This software is part of the state-of-the-art communications concept of the luxury sedan as well. A 15.2-inch color TFT display with an aspect ratio of 16:9 serves as the central monitor for the iPad minis and the other devices of the multimedia equipment. The electrically deployed monitor is integrated elegantly into the headliner made from the finest leather. At night the headliner can be illuminated by a multitude of fiber-optic lights to resemble a starry sky. In addition, the standard screens on the back of the front head restraints can be used to watch TV via DVBT or other programming sources. High-speed USB 3.0 ports integrated into the rear compartment allow connecting additional devices such as a digital camera to the Mac mini. 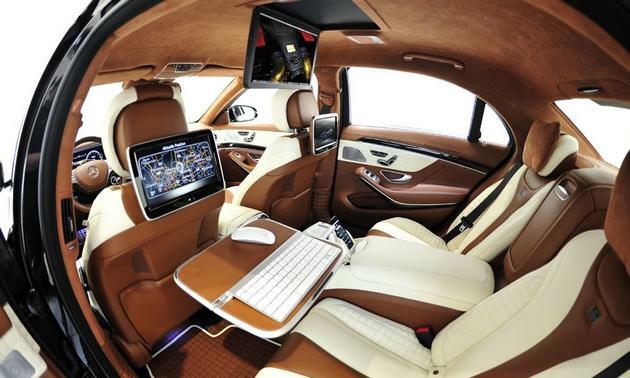 The BRABUS 850 “iBusiness” uses state-of-the-art wireless technology to connect to the internet. The music comes from an Apple iPod touch of the latest generation. With 64 gigabytes of memory it offers enough storage capacity for more than 14,000 tracks. The sound is reproduced by the sound system of the S-Class. The perfectly finished BRABUS fine leather interior can be crafted in the company upholstery shop in any desired color and in any upholstery design from high-end leathers and Alcantara. The selection of wood and carbon-fiber inlays in virtually any desired color and with a variety of surface finishes is just as extensive. At the extremely high speeds the BRABUS 850 “iBusiness” effortlessly attains the aerodynamic properties are of utmost importance. To minimize negative lift on the front and rear axle while creating an optimal balance the BRABUS designers have developed a body conversion kit with sporty and elegant style. The components are manufactured in OEM quality from high-end PUR plastics and carbon fiber, and lend the luxury sedan a dynamic visual upgrade and optimize aerodynamic efficiency. The BRABUS front fascia replaces the production bumper in its entirety. It captivates not only with its striking looks that includes large stylishly integrated air scoops that optimize the supply of cooling air for the radiators, engine and front brakes. Its shape was optimized in the wind tunnel and consequently also reduces negative lift on the front axle, which plays a role in the further improved handling stability at high speeds. The side of the each front fender is upgraded with a BRABUS design element made from clear-coated carbon fiber, with a choice of matt or high-sheen finish. The integrated BRABUS logo is optionally available in a backlit version whose illumination is activated by operating the remote control or by pulling on a door handle. At the same time the LED lights integrated into the underside of the BRABUS rocker panels also light up. The underfloor lighting makes approaching the car at night safer and helps to avoid stepping into a pothole or puddle. The BRABUS aerodynamic-enhancement concept was designed for all current S-Class models with short or long wheelbase. It is rounded out by the BRABUS rear separation edge, which is also available in a version made from clear-coated carbon fiber, and the rear fascia with integrated diffuser and tailor-made cutouts for the BRABUS sport exhaust system. Also contributing to the striking designer look and the even more dynamic and safer handling of the Mercedes S-Class are the tailor-made BRABUS Monoblock alloy wheels with diameters of 19, 20, 21 or even 22 inches. Forged BRABUS “PLATINUM EDITION” wheels in size 9Jx21 on the front axle and size 10.5Jx21 wheels in the rear are available as a 21-inch tire/wheel combination. Customers can choose from three different designs: mirror-finished Monoblock VI wheels with six double spokes, Monoblock F cross-spoke wheels or the new Monoblock R wheels where the spoke pairs are arranged in two different plains. 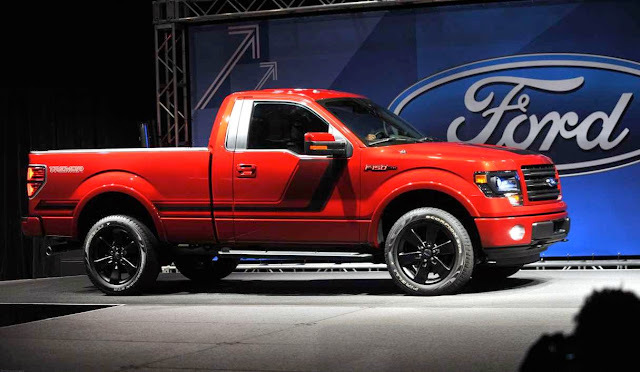 Continental, Pirelli and YOKOHAMA high-performance tires in sizes 255/35 ZR 21 in the front and 295/30 ZR 21 on the rear axle were selected as the optimal tires. A BRABUS 22-inch tire/wheel combination for the S-Class celebrates its world debut at the 2013 IAA. The BRABUS Monoblock G “Platinum Edition” forged wheels feature a combination of size 9Jx22 wheels and size 255/30 ZR 22 tires on the front axle with size 10Jx22 wheels and size 295/25 ZR 22 tires in back, and make full use of the available space below the wheel arches. To further enhance the high level of dynamic handling of the high-performance luxury sedan BRABUS has developed a special control module for the air suspension of the S-Class. It lowers the ride height of the BRABUS 850 6.0 Biturbo “iBusiness” by some 15 millimeters (0.6 in.) without impairing the outstanding ride comfort. Maximum stopping power is even more important than exceptional acceleration and thus the BRABUS high-performance braking system is part of the technical highlights of this vehicle. It features anthracite-colored six-piston aluminum fixed calipers with golden BRABUS logo and vented carbon-ceramic discs measuring 380 x 34 millimeters (14.9 x 1.3 in.) on the front axle. The carbon-ceramic discs were developed in cooperation with brake specialist Brembo, and are manufactured from an entirely new material. The new structure of the disc and the material drastically increases thermal diffusivity, resulting in a much higher performance of the braking system compared with conventional systems. 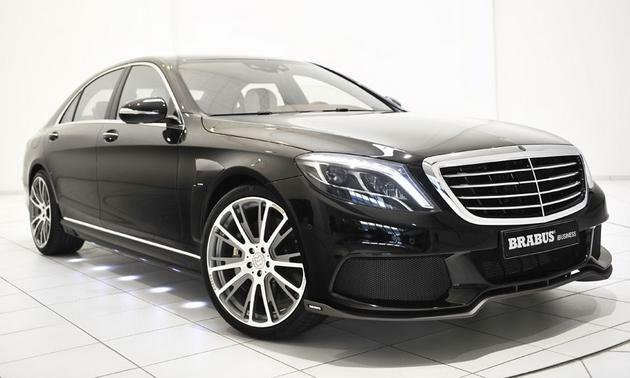 The BRABUS 850 6.0 Biturbo “iBusiness” is built to order. The multimedia system and all other BRABUS tuning components are available for all current S-Class models. BRABUS engine tuning is also available for all other engine variants. 625 kW / 850 hp, 1,450 Nm of torque, 3.1 sec. for 0 – 100 km/h: These are the outstanding performance data of the BRABUS 850 Shooting Brake 6.0 Biturbo 4MATIC. This makes the high-performance automobile based on the Mercedes CLS 63 AMG Shooting Brake the world’s most powerful street-legal all-wheel-drive wagon. The exclusive five-door car from BRABUS features the new V8 high-capacity engine and offers high-performance in its purest form: with forged BRABUS Monoblock R “Platinum Edition” 20-inch wheels and a dynamically styled aerodynamic-enhancement kit it also sports an extravagant appearance. Following three performance levels for the CLS 63 AMG that produced 430 kW / 584 hp (576 bhp), 456 kW / 620 hp (611 bhp) or 537 kW / 730 hp (720 bhp) with the BRABUS B63S – 730 performance kit, the BRABUS motor engineers have now opened the door to a new performance dimension for all current CLS 63 models – four-door coupe or Shooting Brake. The BRABUS 850 6.0 Biturbo high-capacity engine is the crowning achievement in the BRABUS 2014 engine line-up. Delivering high-performance by means of increasing displacement is a long-standing and successful tradition at BRABUS. In this case, a displacement increase to just shy of 6.0 liters (361 cu. in.) joins forces with an even more efficient turbocharging system with two turbochargers. The step up from standard 5,461 cc to 5,912 cc (333 to 361 cu. in.) requires quite a lot of technical effort. After increasing the bore of the eight cylinders in the BRABUS engine-building shop the engine is rebuilt with a precision-balanced billet crankshaft with a stroke of 96 instead of 90.5 millimeters (3.77 instead of 3.56 in). The engine is also fitted with eight forged pistons and billet piston rods. The two cylinder heads are also optimized for improved mixture flow. The extensive redesign not only covers the inner workings of the engine, the peripherals are also upgraded to the high-performance configuration. The production turbos give room to two turbochargers with larger compressor unit and modified exhaust manifolds. To keep the charge-air temperature as cool as possible, the intake and charge-air pipes are fitted with eye-catching BRABUS “Gold Heat Reflection” sheathing. The standard intake manifold is also not designed for this much power and is replaced by a special development from the BRABUS engine department. The BRABUS 850 intake manifold consists of an air filter box with larger intake cross section. It is supplied with air through an air duct integrated into the hood. Its larger intake pipe is positioned in the front fascia directly exposed to the relative wind. On the exhaust side, metal catalysts and a BRABUS sport exhaust system with controlled butterfly valve ensure optimal power yield and a thrilling exhaust note. 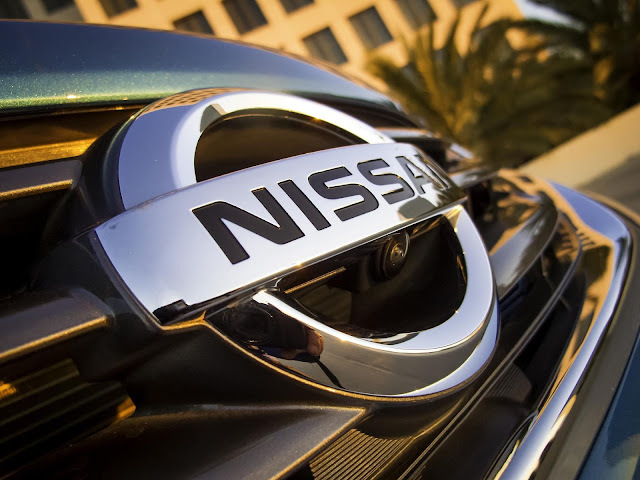 At the push of a button drivers can choose whether to enjoy a full-blooded and earthy V8 exhaust note in “Sport” position or listen to a subtle whisper in the “Coming Home” mode. The fully stainless-steel exhaust system also has a visual effect: in conjunction with the BRABUS diffuser for the production fascia the two ceramic-coated design tailpipes marked with BRABUS logo lend the rear end of the CLS an unmistakable look. BRABUS has a test-rig park with state-of-the-art simulation technology that is second to none in the tuning industry. The motor engineers used this hardware not only for endurance tests to ensure the proverbial durability of a BRABUS engine. Together with the electronics engineers they developed tailor-made mapping for the electronic engine management system. The objective was not only maximum performance: also part of the performance specifications were a harmonious and superior power delivery over the entire rev range and exemplary exhaust emissions. A displacement of six liters (361 cu. in.) and two turbochargers result in the most powerful engine to date based on Mercedes-Benz: the BRABUS 850 6.0 Biturbo high-capacity engine produces 625 kW / 850 hp (838 bhp) of power at a low 5,400 rpm. And the eight-cylinder engine also sets a new benchmark for peak torque: between 2,500 and 4,500 rpm the engine produces a steady torque of 1,450 Nm (1,069 lb-ft). 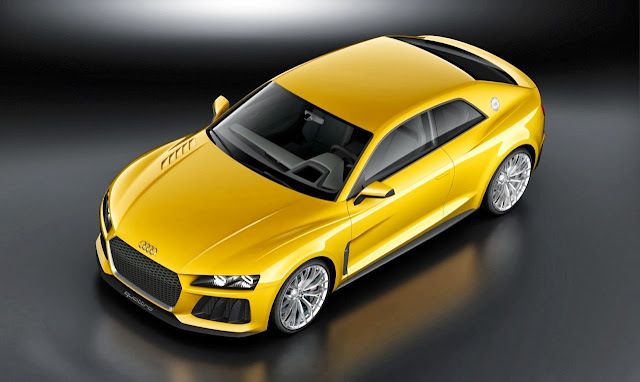 To protect the powertrain torque is limited electronically to 1,150 Nm (848 lb-ft). Like all BRABUS components this high-performance engine is backed by the one-of-a-kind BRABUS Tuning Warranty of three years, up to 100,000 kilometers/62,000 miles (see BRABUS Warranty Terms and Conditions, updated July 2013). The new top-of-the-line engine, which is operated exclusively with high-performance lubricants from technology partner MOTUL, is available for all current CLS 63 AMG models, Coupe and Shooting Brake, with rear-wheel or all-wheel drive. Especially the 4MATIC version of the BRABUS 850 6.0 Biturbo delivers acceleration figures previously unimaginable for sedans or wagons. From rest the BRABUS supercar sprints to 100 km/h (62 mph) in just 3.1 seconds. The model with only two driven wheels takes six-tenths of a second longer. The unique performance of the engine also gives the tuned CLS 63 AMG an unrivalled top speed. The BRABUS 850 high-capacity engine propels the four-door coupe to a top speed of??? km/h (??? mph). At these speeds efficient aerodynamic properties are absolutely essential. For this reason the carbon-fiber front fascia developed specifically for the BRABUS ROCKET 800 with a top speed in excess of 370 km/h (230 mph) was adapted to both body styles of the CLS 63. The fascia was optimized in the wind tunnel and minimizes negative lift on the front axle while lowering drag at the same time. The fascia also includes the complete radiator frame. The air slots integrated above the radiator grille route additional fresh air to the new intake manifold. The carbon-fiber design elements in the front fenders are also part of the sporty-dynamic appearance of the five-door car. The BRABUS rocker panels with clear-coated carbon-fiber inserts and integrated LED entrance lights calm the airstream along the sides of the vehicle. The rear of the ultimate lifestyle wagon is refined with a clear-coated carbon-fiber BRABUS diffuser with tailor-made cutouts for the dual tailpipes of the high-performance exhaust system. High tech and design also enter into a perfect symbiosis in the wheels of the BRABUS 850 6.0 Biturbo. Thanks to state-of-the-art forging technology the BRABUS Monoblock R “Platinum Edition” wheels reduce unsprung masses to a minimum. At the same time they have a fascinating and innovative design with two sets of five double-spokes alternatingly polished and painted anthracite grey, arranged in two plains. Of course dynamic handling doesn’t come up short either: the size 9Jx20 front wheels with size 255/30 ZR 20 tires provide excellent grip as do the size 295/25 ZR 20 tires on size 10.5Jx20 wheels on the rear axle. The perfect high-performance tires are supplied by BRABUS technology partners Continental, Pirelli or YOKOHAMA. Exclusive BRABUS fine leather interiors that satisfy any customer request are another specialty realized in the company upholstery shop. The BRABUS 850 6.0 Biturbo can be equipped with the finest leathers and Alcantara in any desired color. Scuff plates with backlit BRABUS logo and the rear tables for installation on the back of the front seats add individual highlights as do the markedly sporty aluminum components such as pedal pads, door-lock pins and shift paddles on the steering wheel. The product portfolio also includes high-quality clear-coated carbon-fiber inlays for the instrument panel and center console in any desired color as well as wood trim in any desired color and grain.